Periodically, I attend events where women have asked, “How do you ride in a skirt?” My response: “I put it on and I just get on with it.” However, it is a fair question. I’m wearing a Leona Edmiston dress. The print is of Venice, one of my favourite cities. The contrasting jacket is from Zara and helps me to be visible and warm during Spring and Autumn. I wear dresses most days because I don’t have much time to myself in the morning. Tending two young children, making breakfast, school lunch and dinner, drop-offs at school and childcare and getting to work make for a busy morning. My husband Justin makes breakfast most mornings and our kids lunches which helps enormously. He also drops the kids off when he can. Fortunately, when I choose a dress. I’m done. There is no need to match anything else. It leaves a little time for makeup and perfume. Applying eyeshadow is like painting (quickly) first thing in the morning! While there are different skirt shapes from which to choose, I prefer the knee-length pencil skirt as it stays in place while I am riding. The kick pleat in the back provides more space to pedal. If the skirt is very tight, I pull it up a bit which makes it easier to pedal. I tend not to wear fuller skirts because of the possibility of skirt “fly-up”. Of course, there are variations between these two extremes. If the skirt is a little fuller, I usually wear a garter mid-thigh and tuck the hem in to prevent fly-up. The skirt length of this dress, above the knee, will result in a bit more leg flash. The other factor to consider is skirt length. Knee-length skirts result in a hem which rises to mid-thigh on the saddle. Some of my dress hems are shorter and consequently, the skirt rises to the top third of my leg. Not only am I showing bicycling tan lines when this happens but probably a bit of underwear. I’ll talk more about that later. My Max Mara linen wrap dress has a mid-calf hem and is the worst offender. The incidence of skirt fly-up is 100%. In that case, not only am I flashing underwear but also belly button. For that reason, I always wear a bicycling garter with that dress. I’ve seen photos of women placing a hand on their laps on the Copenhagen Cycle Chic website. While that motion appears very genteel and discreet for preventing fly-up, I don’t believe that we have enough bicycle infrastructure to support that gentility here in Sydney. I ride on the road most of the time as the bike lanes don’t connect. As a result, I feel more comfortable covering my brakes not my lap. Yes, more leg flash but never mind. I’m just blur to most pedestrians and drivers. With regards to flashing your underwear to oncoming drivers, cyclists, pedestrians, school children on buses, tourists etc. I believe there are two approaches. One, is to not care. It’s usually just a moment anyway. It’s a good excuse to buy beautiful lingerie. The other is to care. It’s possible to wear a dark cycling short underneath or a longer-length undergarment on top of your underpants. You can remove either when you reach your destination. If my skirt is very short, I have been known to wait at the lights with both feet on the ground. The step-through is also handy for locking up easily. Lastly, how to get on your bicycle? The eZee Sprint is a step-through which makes it easier to mount. If you don’t have a step through, one approach is to bend your knee and straighten it as you pass your leg over the saddle and through to the other side. Finally, if either of those don’t work for you, stand on the kerb with your bicycle in the gutter. The additional height will help you to get your leg over or step through and off you go! 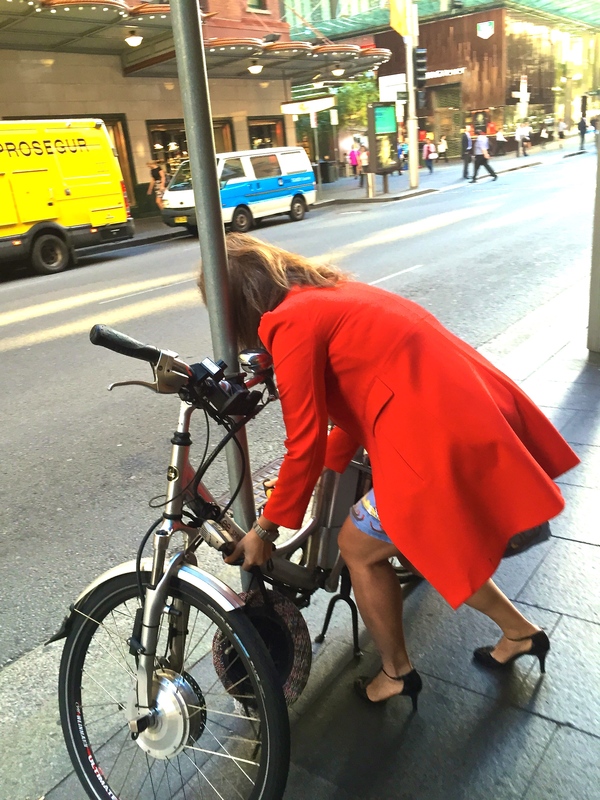 Today’s ensemble: Leona Edmiston dress, Zara jacket, Yakkay helmet, Big W sunglasses, Geox heels. The lady in red… are you faster in a red coat? A great post as riding in a skirt should not be seen as impossible. Keep on riding elegantly! 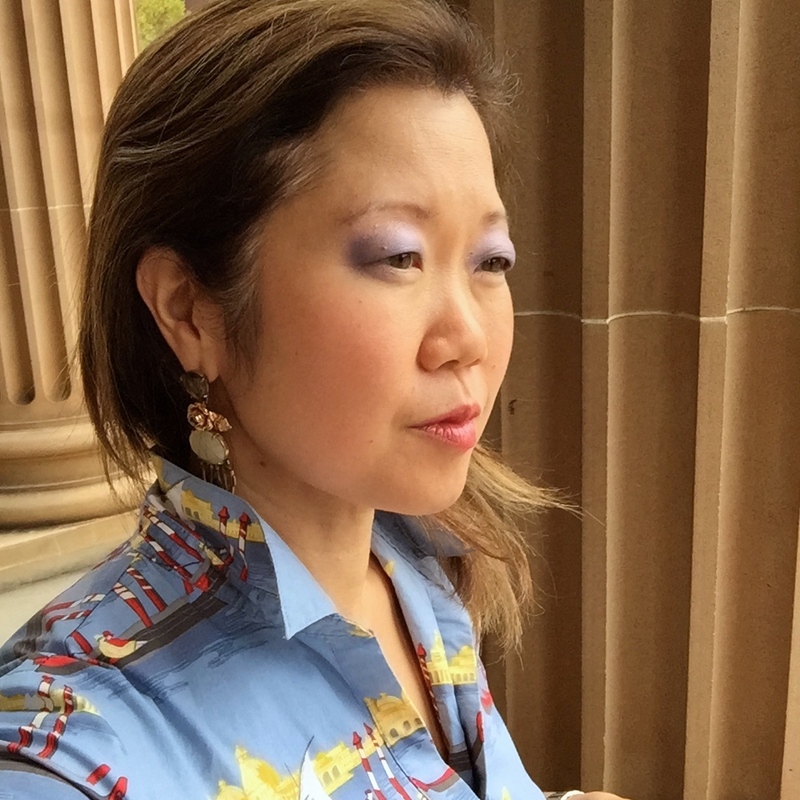 I have just come across your blog via the Sydney Suit Ride post on Facebook, and I am enjoying it very much! 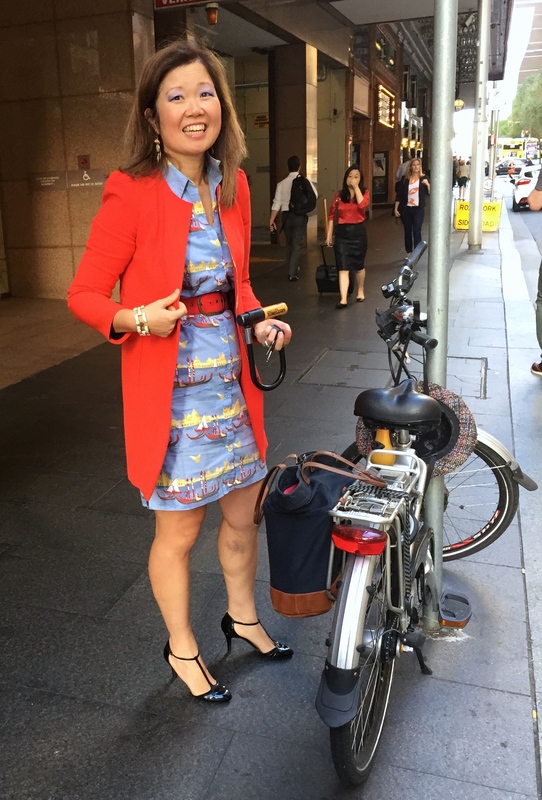 I rode a bike a lot when I was living in China – and I keep thinking about the time I made the mistake of wearing a wrap around skirt one day! It was awkward but the memory still makes me laugh! In China I just got on my bike and pedalled, whatever I was wearing – as did everyone else from what I could work out!